I am working towards completing my works in progress. I really have the bug to get everything wrapped up and decks cleared to start some new projects. This. This is the white whale. I must have this quilt. I must. I have the ombre bundle sitting in my studio. I have the desire. I probably have the skill. I want to own that quilt. I want to focus on it completely. And so I am wrapping up things. Last weekend I finished a quilt top so it could be sent for quilting. I wanted to finish a project per weekend, but didn’t get there this weekend. And I am fixated on how much “done” do I need to be. I have a plethora of orphan blocks that should be used for something useful. What do I do about those? I am going to use them up. These decks are going to be cleared!! New quilt for our bed. We growed-up the decorations in our room and so I want a new quilt to go with them. Living Room wall hanging. I created a new wall hanging for our living room not that long ago. But these mysterious black stains appeared on it when it was washed and it bugs me unreasonably. I want to create a new one to replace it. Goal for getting this done is 1/31. 3. 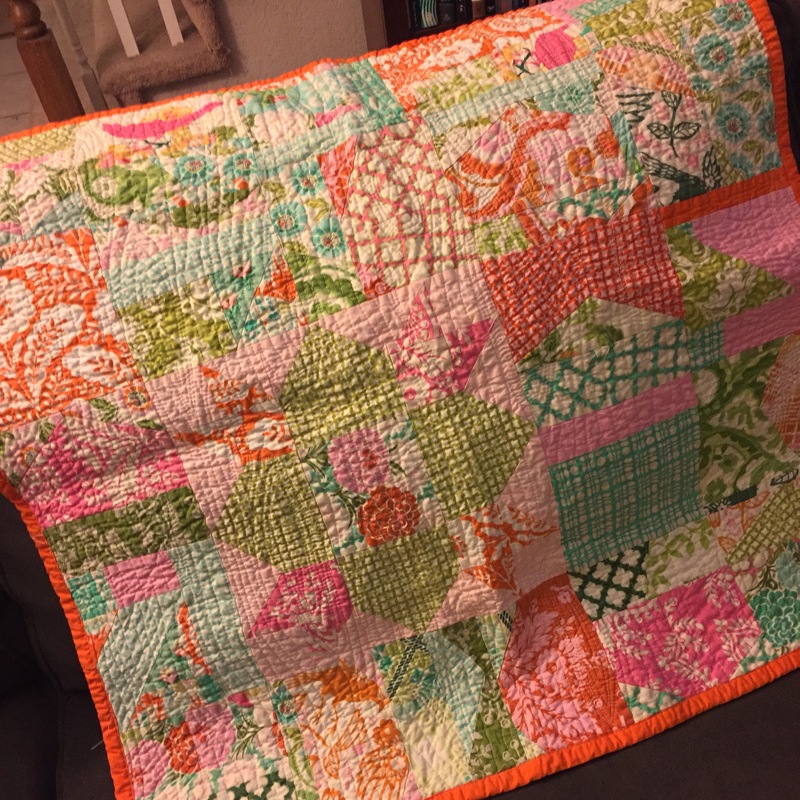 Heather Bailey improv quilt. I still have a lot of Heather Bailey scraps that I want to make into a quilt for my studio. I have started with these adorable blocks. My goal for getting this quilt done is 2/7. 4. Lots and lots of Project Linus quilts. I think most of these orphan blocks from my abandoned farm girl vintage quilt and those that I didn’t use in my stepdaughter’s quilt will make great Project Linus quilts. But creating all of those quilts could take me another 3 months. My “find the gray” compromise will be to work on these interspersed with the WIPs above. I got a start on a baby-sized quilt this weekend with some orphan blocks. Here is to getting stuff done!! I have been suffering a lack of productivity in my quilting world. Starting around the time I got my perfect craft room, I couldn’t summon much energy to get a lot done. I am not sure why – not inspired, not energetic, the pull of binge watching Netflix. And then on Sunday I decided to finish my stepson’s quilt top. A top I started a loooooong time ago – like March of last year. I love the fabric, the pattern – but the process is laborious. Each row takes me 2+ hours. I am so glad to have this quilt top done. So glad. And now I feel that pull to finish the rest of my WIPs. Right now there are 3 – new wall hanging for my living room, new bed quilt, the last of my Heather Bailey improv projects. I have a real gem I want to work on once I am through those 3, so I will keep my eye on the prize. It would be so great to have the decks cleared. This is a little quilt I made for a coworker who had a very difficult birth much earlier than expected. It is a lot of improv and the “Welcome” block from Farm Girl Vintage by Lori Holt. All in gorgeous Heather Bailey fabric. 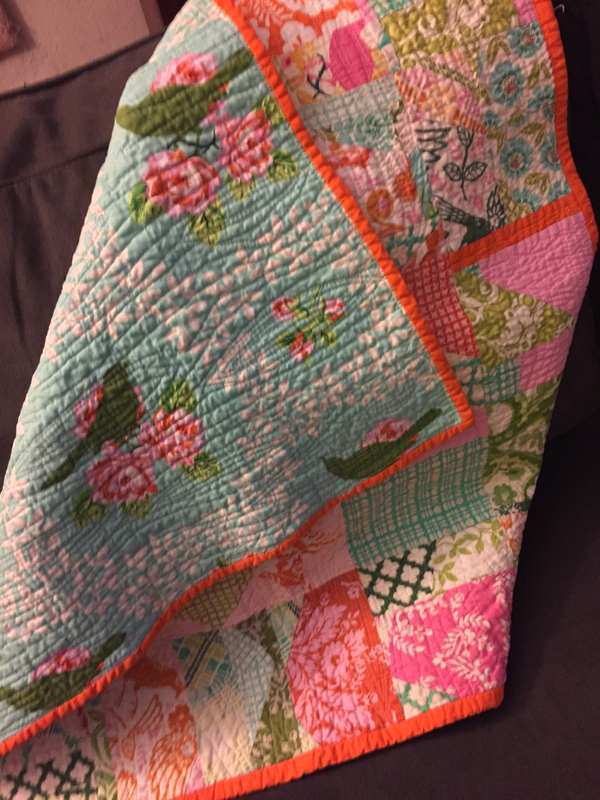 I haven’t heard from the mom yet if she likes the little quilt – but I hope so. Mom and baby are healthy and home now. Yay for happy endings.